It’s been a good week. We’ve had food and beer matching, there’s been Leicester’s first frozen yoghurt, and of course I’m still embraced by the warm glow of the memory of our week in Catalonia. So I didn’t know it could get any better, that it would get better, and that I would meet even more incredible people and try amazing things here in our lovely city of Leicester. I only went and did it though, didn’t I? Oh yes, I went down to Gelato Village and met the indescribably wonderful Daniele and Antonio – owners, creators and artists in freezy treats. 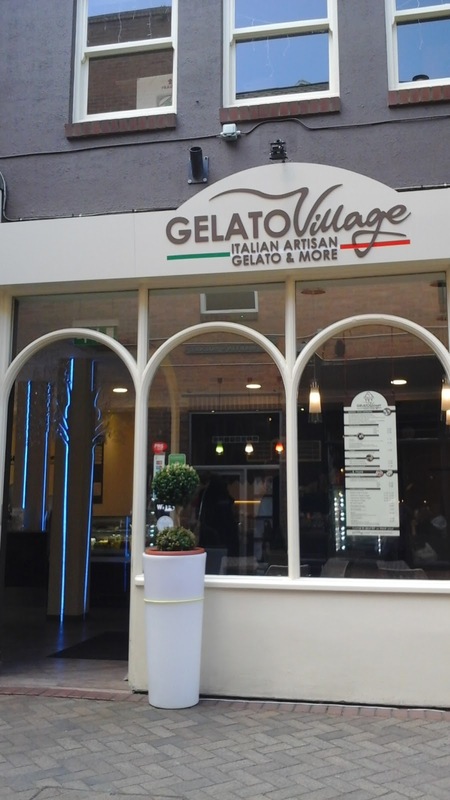 A relatively new Leicester business, Gelato Village has just been open for 10 months, but already it’s making a big impression. At the time of writing they are ranked #1 tea and coffee places and the #2 best place to eat in the city on Trip Advisor. Leicester has welcomed finely crafted, artisanal and fresh gelato with open arms. And why shouldn’t we? It’s flippin’ delicious. So there are many tales that Daniele and Antonio can tell you. I debated about whether to write this as a blog post or simply cut out the middle man and go straight to a novella, about the pilgrim’s progress of this pair of wonderfully creative Italian men. But I don’t know any publishers, so you’ll just have to like the post as it stands. You never know, I may return for a follow up, just to hear more of their fascinating facts and tales. And to eat more gelato. Clearly. It was a warm June day. The sun was shining as I entered the understated gelateria. Everything about Gelato Village is (understandably) refined, stylish and oh so very Italian. I had never thought that I would get even a sniff of the experience of buying and eating a gelato on the same square as the Trevi Fountain in Rome, but they really have brought a slice of relaxed Mediterranean indulgence to our fair city. The muted colours of the parlour give a chic feel to the comfortable surroundings. You are welcomed by beaming smiles from friendly staff who genuinely care about their product and your experience. And hopefully, once they’ve stopped digging up Cank Street, we’ll all be able to enjoy a little Al Fresco Italiano as well. First I sat and we chatted. I had a delicious latte, which was both rich and delightfully bitter as well as wonderfully creamy – just what I remember from when The Boy and I had our first holiday together, camping for a month in Pompeii – we spent the first night in a hotel in Naples and got our first taste of real Italian coffee at breakfast. Needless to say we were so taken by the glorious flavour that we quickly worked our way through the entire coffee menu and then emerged blinking (and twitching slightly) into the Campanian sunshine. As ever, I digress. There are enough stories for me to retell for you about Gelato Village without me throwing in my own anecdotes. Once my coffee had arrived, Antonio and Daniele spun me the yarn of how Gelato Village came to be. They have lived in Leicester for over 10 years, both in very different professions – one a nurse, the other an IT specialist. From Turin, they had seen others regenerating and reviving the traditional gelateria, including a successful pair of local gents who had taken the beauty and craft of the gelato-making orthodoxy and given it a contemporary twist, to great effect. So they found themselves struck by inspiration when holidaying under canvas somewhere in the desert between Egypt and Sudan (see, I told you they tell a good story!) and ran the idea of bringing traditional Italian gelato to Leicester past a business minded friend. He took very little convincing and so the intrepid duo began to believe that there was a viable business in bringing something they loved from their home country, to their new adopted land. So then Antonio was determined to make this dream a reality. He goes off to Bologna for two weeks, to Gelato University. Yes, Gelato University, that is a real thing and does exist. He arrived knowing nothing about how to make gelato, just to see how it went, and came away understanding the science and knowing the equipment and the ingredients that were needed to create real gelato. He found it so rewarding to make a great dessert from his own recipes, to become the person behind the product. And so, he and Daniele decided to take the gamble, using their own savings and some investment from friends. The question they had to ask – “Is Leicester ready?” When they had first arrived it was hard to get a good coffee, but now the city has great businesses like St Martin’s Tea and Coffee who roast their own beans locally. Times had changed – people were more open to new concepts and desirous of better quality. And they knew we were ready. “Ready for ice cream?” I hear you cry, “we’ve had ice cream before! Why do we need to be ready for that?” Well this was the challenge that they faced. It isn’t ice cream, it’s gelato. They have different ingredients and composition, and are made by different methods. For example, did you know that gelato has significantly less fat and sugar than standard ice cream? (Their current estimate is that the sorbetto runs to around 120 calories per 100g and is fat free, the gelato contains milk and so has more calories and fat, but given the seasonal nature of the ingredients it is harder to calculate.) They can explain the process much better than me, and more to the point, you can see it for yourself. As the window into the kitchen says, ‘Our gelato has no secrets’ – take a peek and see the process (and the difference) for yourself. And so Leicester was ready, the Italian boys were ready, and Gelato Village was born. 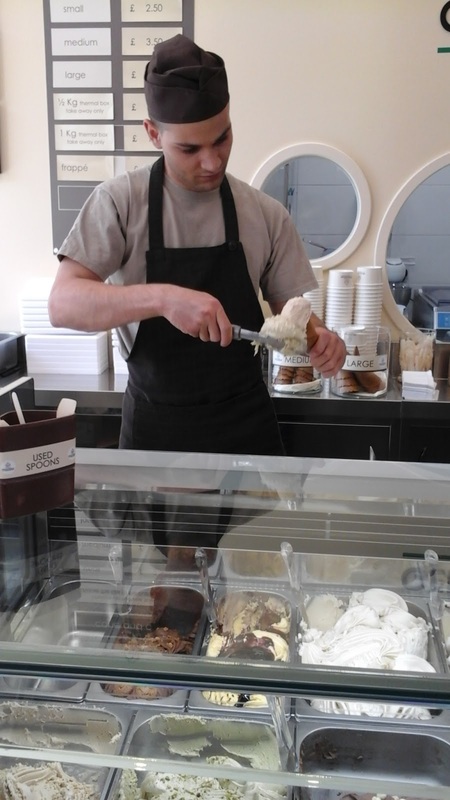 They use seasonal produce, fresh on site, to make their gelato. It is created, not manufactured. There are no ‘flavour powders’ like you would get making ice cream. There are, surprisingly, no flavours at all. A tiramisu flavoured gelato, for example, would be a gelato that has been made to taste like tiramisu. They take all of the ingredients that would be used to make a tiramisu and make it into gelato. All the milk and double cream used is sourced locally from rare breed Red Poll cattle at Belvoir Ridge Creamery. This is non-homogenized milk, so it is itself a seasonal product, with the flavour changing according to the current climatic conditions, the cow’s diet and so forth. The cream is also used to make whipped cream on site to add to your gelato experience. Along with the local, seasonal produce, they also source the very best ingredients for specific flavours – all free from colourings or additives. The best pistachios they have found come from Sicily. In combination with the wonderful local milk, this creates a pistachio gelato of such epic proportions that even visiting Italians remark upon its wonder. Similarly, the hazelnuts they use come from Piedmont, their home region. They have a more delicate flavour and are world renowned. 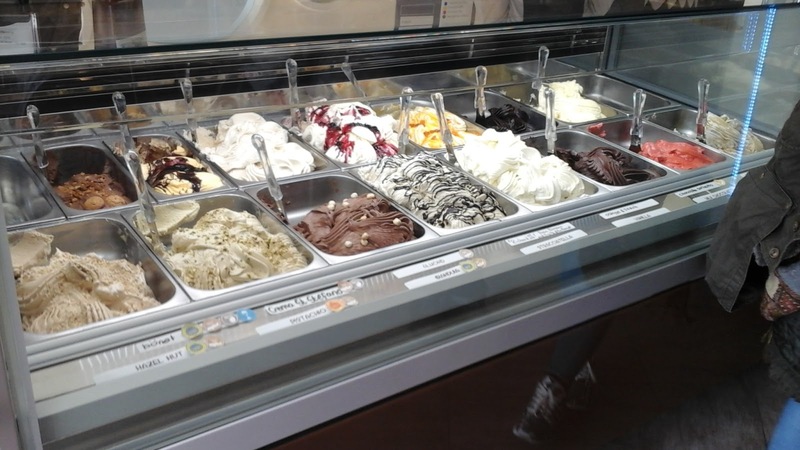 Gelato Village use them to create both traditional and innovative taste combinations. It turns out that you can pretty much do anything you want with gelato. They have already created a rose and forest fruits ‘Richard III’ gelato, made with an infusion of rose petals on the premises, which has a very subtle florality underneath the creaminess of the gelato and the sharp but sweet mixed fruit compote. They are also well known for their salted peanut gelato, an American inspired combo made especially for their close neighbours at Crafty St Martins. I asked if you could, or would, make a savoury gelato and it seems you totally could. People are already experimenting with gazpacho style tomato gelatos, and this is something that the Village may take forward in the future. Although I have to agree with Antonio who told me he had once seen a gorgonzola gelato, but that was where he drew the line. And as I’ve mentioned, you take out the milk and then you create sorbetto. This is vegan friendly, suitable for the lactose intolerant and gluten free. And for all of you vegans, you may be excited to hear that it comes in chocolate. Chocolate. It is incredible. The punch of the very finest quality cocoa smacks you with its bitterness and rich chocolatey flavour, which then fades away as the sweetness kicks in. It is luxurious, smooth and amazing. And so I tasted. Then I tasted. Then I tasted some more. 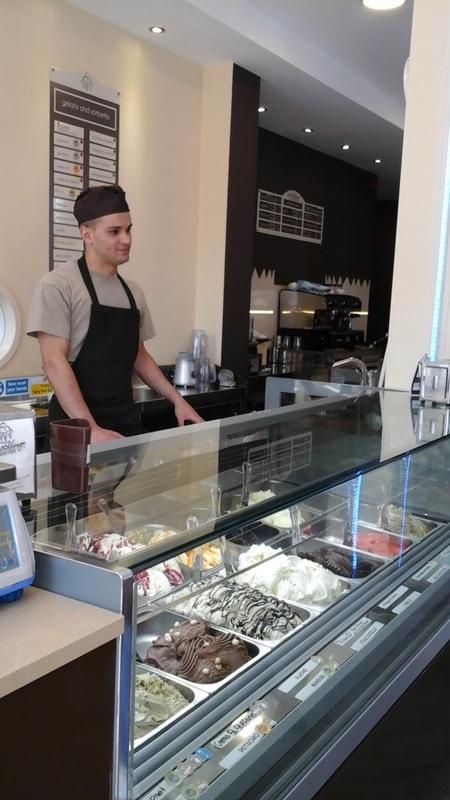 Their staff are trained to an incredible level, where those who came in knowing nothing about gelato are now able to make it for themselves to the incredibly high standard that Gelato Village hold dear. And they can tell you about the taste, the ingredients used, how they were sourced. And they did – but you should go and find out more about the flavours you like for yourself. I had the pistachio, which absolutely slayed my world. I tried the Richard III, the chocolate sorbetto and then contrasted it with the softer, creamier taste of the milk chocolate gelato. I tried the hazelnut and the almond, they were the finest refinement of nut flavours in frozen dessert form. I also tried the banana and caramel – 40% banana, about 280% banana taste. Another amazing, punchy flavour where the sweetness of the caramel drizzled on top really brings out the best in the fruit. So, let’s recap. Seasonal ingredients – some the best local products which are the best you can get, others the very best in the world, sourced to bring the finest flavour to you. Many options for vegetarians (only the alcoholic gelatos would be a problem), and vegans, and people with intolerances. Created on the premises, and served immediately – the gelato keeps for 3 days at the very longest, and so what you see if what they have, there isn’t a stack of pre-made product out the back, they make it to meet your demand. And then they asked me to pick my favourite to take away. I had to try a waffle cone (sourced from Salford, of all places, but incredibly delicious). The best thing is that whatever size of tub or cone you pick, you can still have up to three flavours. Since I’m a bit nutty, I went for the pistachio (to die for), the hazelnut (to have a taste of Antonio and Daniele’s home region of Piedmont) and the almond (because it’s like marzipan without being overly sweet and being better than marzipan). 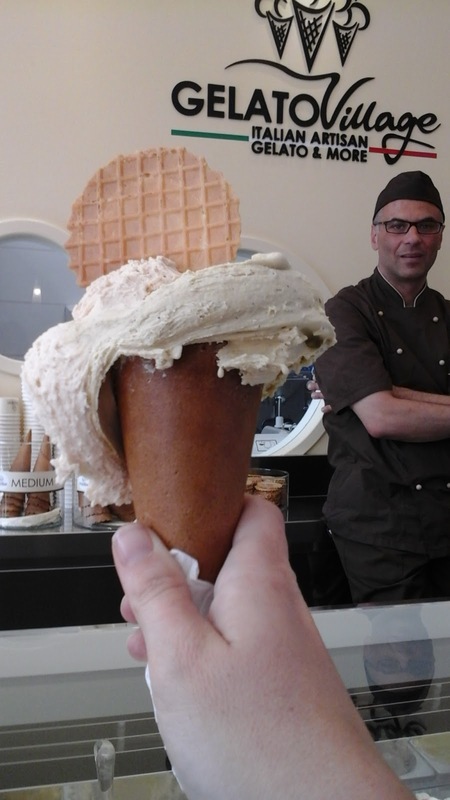 I was literally astounded by the amount of gelato they are able to pack into a single cone. I am pretty sure the staff are being trained to defy gravity. And so I walked back to work after the most satisfying lunch break ever. You may have picked up the sense that I like Gelato Village. They have a great story and an incredible passion for their product. And what a fabulous product it is, smooth, textured, sweet and incredibly flavourful. Natural and fresh it is a feast for the senses. If you haven’t visited the shop yet, then I can only say that you must. And, wonderfully, they are open late – until 10pm most nights and 11pm on Friday and Saturday. And so, with the continental culture of evening strolls with friends and family through the town, enjoying a coffee or a gelato, they truly have brought a slice of Italian culture to Leicester. Long may it last.